Australian Hiker | Is it time to get new footwear? I’ve had been meaning to write this article for a while but after witnessing an epic shoe blowout on a hike in the Australian Alps it just reinforced the need. The incident that I just mentioned involved a young couple hiking the 22km Main Range Walk in the Australian Alps. When I came across them the male of the couple was taping up his partners shoe with duct tape as her shoe had basically collapsed and they still had around 11km to walk! Now while Duct tape has magical properties you don’t want to rely on this if you have a choice. This incident focused me on the footwear other people were wearing and what I noticed surprised me in a number of ways. Not only were a number of hikers wearing inappropriate shoes eg thongs and sandals, but a number of people were also wearing shoes that looked like they should have been thrown out months ago. As a rough guide expect a pair of trail running shoes (used for hiking as opposed to running) to last around 900-1200+km. This is an arbitrary figure and will be different for everyone. Boots? I retired my last pair of boots after 6 years and over 2000km. Now these boots cost a lot of money but ‘you get what you pay for’. What’s the traction like? Are you are loosing grip on steep and loose trails? In most cases this is the deciding factor for me to throw away shoes. Shoes that are losing traction can be dangerous and can result in injuries. Are the shoes still comfortable? Many shoes will loose support as they get older with the midsole softening up and your feet will become sore when they didn’t before. Have the tops of the shoes collapsed? Are the shoes starting to delaminate with the sole and shoe top separating? These are all factors in deciding if it’s time to throw you much loved friends out. The above factors apply to all shoes regardless of whether they are boots or trail runners but as mentioned expect a pair of good quality boots to last much much longer. 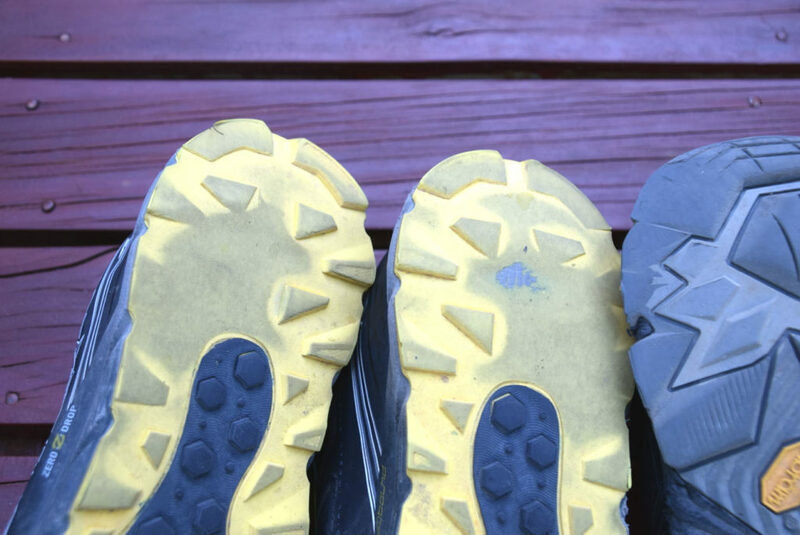 Our footwear is probably the most important piece of equipment we own as hikers and while it’s temping to make a pair of shoes/boots last just that bit longer ultimately your long term comfort and foot health should be the main priority. If you haven’t had a close look at your hiking footwear lately then its time. ‘If in doubt throw them out’ as life’s to short to be wearing footwear that are past there use by date. My original pair of Altra Lone Peak trail running shoes. 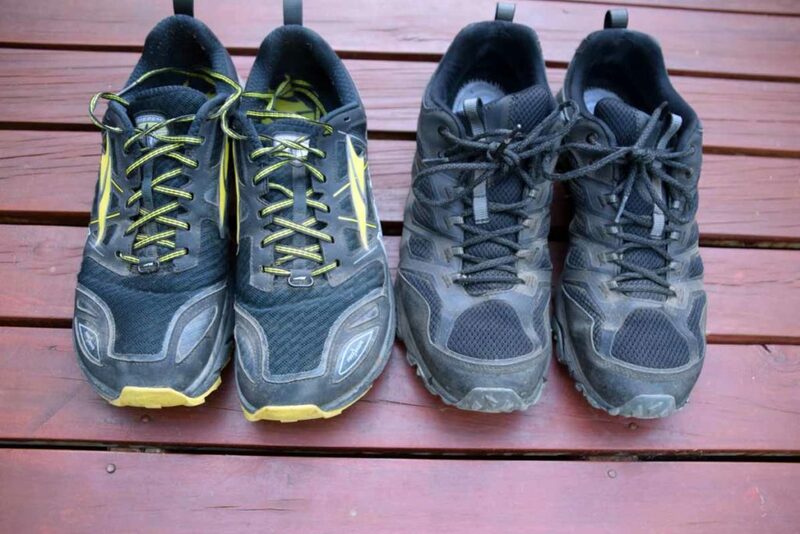 These shoes in this photo were just on 12 months old and have done around 1000km in a variety of conditions. The wear towards the outside of the rear of the shoe is pretty typical for me and you can see on the right hand shoe that I have worn through the out sole and and am now onto the second layer of rubber. With these shoes in this condition I find myself loosing traction on loose trails which can potentially cause injuries. Further to the above comment I continued to wear my Merrell FST’s for an additional three months, and a further 400km after I wrote this article because they were just so comfortable. I only stopped wearing them when my feet started to get noticeably sore which is a rarity for me.